Looking for the best romantic movies? Need a sensual video to watch in front of the fire? Trying to find a list of the best romantic comedies? From the Twilight series to When Harry Met Sally to The Wedding Date, browse our movie reviews, watch previews and get romantic! Each page has the alphabet at the top and bottom. Click on a letter to find movie listed under that letter. Browse brief romantic movie descriptions and my personal review. To go to Netflix (for romantic movie rentals), click on the text link under the picture. To go to Amazon (to purchase romantic movies), click on the picture. 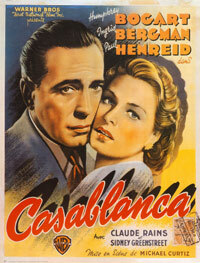 To view products like movie posters, books and movie paraphernalia, click on the additional links. To shop for Romantic Movies and Romantic Movie Collections to browse and buy, go to our Romance Movies Store. Buying romantic movies in collections is a great way to add to your romantic movie library without breaking the bank! I think I am probably the world's biggest fan of romantic movies. I never get tired of them. D. (bless his heart) likes to watch other things besides romantic movies, so we alternate romances with action adventures, dramas, comedies and thrillers. Whenever it's my turn to choose; I always pick Romance Movies. I just have to decide if I want to see a Romance Classic, a Romantic Drama, a Romantic Comedy, a Foreign Romance, an Indie Foreign Romance, an Indie Foreign Steamy Romance, or all of the above! We used to be video store junkies. We would spend hours trudging up and down the aisles looking for movies to watch. Then we would stand in line and cringe at the "new release" prices. And then, to add insult to injury, nine times out of ten it seems like we returned them late and had to pay late fees. They sure loved us at the video store! We live over 30 minutes from the nearest video rental store. Sometimes we would feel like watching a movie (romance movies! romance movies!) but couldn't really justify the trip into town. Since we don't watch TV, we would have to go without or dig into our "previously viewed" collection; not always so desirable! Then one day, several years ago, we had a conversation with my father who was (and is) a Netflix subscriber. He said that the monthly fee that he pays is more than worth the comfort and ease of ALWAYS having a movie to watch that he has chosen WHENEVER he wants. He told us how the movies are delivered straight to his mailbox for free and how when he is done he just drops the postage paid red envelope into any mailbox. The new movies he has selected show up within another day or two. It sounded too good to be true, but we looked into it and signed up for a Netflix FREE TRIAL Offer . Needless to say, we were sold and have been happy Netflix customers ever since. I really can't say enough good about their program. It fits perfectly into our lifestyle and no more standing in line at the video store! What works for me is to go onto the Netflix website and spend some time browsing the impressively vast selection, watching the previews and selecting my movies. I check out the new releases and the various romance movie genres like I then put them in my queue: One for D, one for me, one for D, one for me, etc. That way, I don't have to even think about what's coming. I've done all the choosing from the comfort of my home computer. I like that we can keep them as long as we want, too. Sometimes we get busy and don't get around to watching many movies. No problem. It's great having the movies available any time we're "in the mood". We subscribe to their "3 at-a-time (Unlimited) Plan". That means that we can watch as many movies as we want in a month while having three at home at one time. On the unusual occasions that we have received a broken DVD or even more rarely, an unplayable one: All you have to do is go on the website and report the problem and they send you a replacement the very next day! You don't have even have to send the bad one back. We have a satellite connection for our internet (rural living has it's joys...) and the connection isn't very fast. With a more "regular" connection we would also be able to take advantage of their "online viewing" program. Subscribers to the 3 at home program are eligible for umpteen hours of online movie watching every month...and it's FREE! Another great feature that we can use when we are going to be out of town for an extended holiday (I like the sound of that, don't you? )is the Account Hold feature. You can place your account on hold for 7-90 days and avoid the monthly charge. Is that cool or cool? So, the next time you are wishing you had a good romantic movie to watch: RENT movies from Netflix! Hey! What about making my OWN Romance Movies Collection? There are some movies that I like so well, I watch them over and over again. After I have rented them once through Netflix and decided that I MUST OWN THIS ROMANTIC MOVIE, I go to AMAZON to buy it (and other) Romantic DVDs to add to my Romantic Movies Collection. Do you suppose there is a 12 step program for people like me? "Hi. I'm Sara and I'm a Romance Movies-a-holic..."
Check out our romantic movie quote database and discover pages and pages of free movie quotes! It's easy to search movie quotes alphabetically by title or simply browse our list of movie quotes and unearth some romantic gems. Find those great movie quotes NOW!